Regardless of the definition one uses to define Quality, Valentine’s reputation for manufacturing precision metal stampings, components and assemblies, has become synonymous with the word Quality. 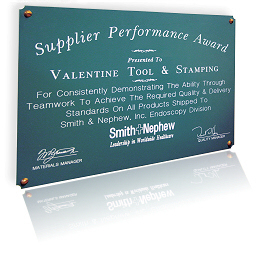 For over 60 years Valentine has successfully satisfied the requirements of many companies including Polaroid, Texas Instruments, IBM, Smith & Nephew, & Medtronic by committing to a philosophy of continuous improvement and by meeting, and exceeding, our loyal customer’s quality expectations. Quality System compliant to ISO9001Standard. Quality system management reviews involving all key management personnel. Adoption of Lean Manufacturing principles: 5S, Kaizen, Value Stream Mapping. Formal company wide training program. Documented Continuous Improvement and Mistake Proofing Programs. In-Process SPC with direct measurement computer input. Modern computer non-contact vision inspection systems. 99% conformance to on-time delivery requirements. Certified components, ship to inventory status for major customers. Raw material lot traceability from receipt to shipment to the customer. Multiple time recipient of customer quality excellence awards. “Part Effectiveness Review” - Periodic multidiscipline review of all process parameters for each customer component, including raw material, tooling, routing sequences, progressive and/or secondary operations, value added operations, and packaging and handling.